Students traveling to Ethiopia for Project Pyramid over spring break were working with the organizations Able and Damascene. Below, both teams have highlighted their trips. Read on to learn more about their time in Ethiopia in their reflections! 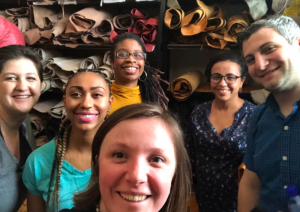 Our team traveled to Ethiopia to work with Fayda, a leather workshop that has a mission to provide meaningful work for a livable wage. Our project is focused on finding opportunities for Fayda to repurpose leather waste and helping Fayda develop its own brand as a leather product producer. Being on the ground in Addis Ababa allowed us to visit other factories to learn about the leather production process, meet with local entrepreneurs to better understand the process of starting a business and dealing with the government, and explore local leather markets to find new opportunities for our client to sell its product. As a part of Project Pyramid, our team of four students spent the first week of May in Addis Ababa, Ethiopia. Our team is working with Damascene, a social enterprise that produces essential oils by using herbs produced by women farmers in rural Bonga. Damscene was founded by Rahel Hurey, a pharmacist who saw potential in the herbs that are locally available in the country. She helped these low-income women realize the commercial value of these herbs that they previously grew in small quantities for consumption, trained them and provided them a sustainable source of income by purchasing their herbs for the production of essential oils. We spent the week meeting Damascene’s partners and observing the production plant. We visited various hotels, resorts and spas where she supplies her products, along with various NGOs and consulting companies that provide support to her organization. We learned that most farmers see little incentive in producing herbs and spices instead of other food crops that they can consume. Changing the mindset of these farmers has been a challenge. Rahel therefore wants to add new line of products to her business; she wants to produce shampoos, lotions and other beauty products using her expertise in chemicals, and utilizing the current scale of herbs that they can produce. In doing so, she believes that Damascene can cater to a wider range of consumers. Financing is a major problem for Damascene at the moment. Our team’s goal is to prepare a strategic plan for Damascene that will help Rahel to introduce the new line of products and help her partner with other organizations or individuals that invest in small scale social enterprises.